The first appearance of one of the most popular comic book heroes in the last 5 years was in New Mutants #98. Yes, I'm of course talking about the first appearance of Gideon! Ok, ok, you got me. I meant Domino. Third times the charm! That's right, any person who has read a Wizard magazine in the past 5 years knows that the comic of the day is the first appearance of Deadpool. This comic supposedly can catch a fair amount of money if it is in pristine condition. I, in fact, happen to own a copy in such condition. Did I go out and buy this book once Deadpool became a hot commodity? Nope. I bought this issue when it was just a random back issue. 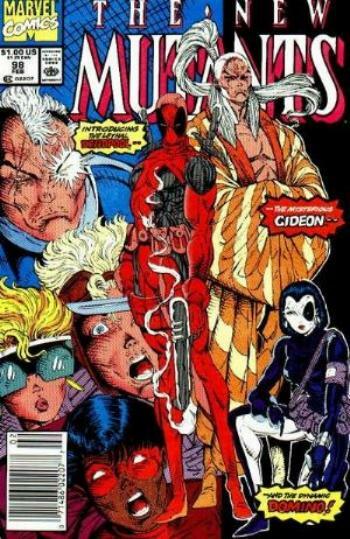 I think it was right after Deadpool's first mini series "Circle Chase" came out. I read that mini series and knew that the character was going to be somebody one day. Maybe not today. Maybe not tomorrow. But "some day", I told the shop-keep as he just stared at me and thought, "whatever kid, and Magic the Gathering will fade away." Me and the shop-keep shared something that day. And that is why I had to murder him.